Tis the season for festive gatherings and knowing what to eat can be a challenge for coeliacs. Many canapes contain gluten and this scenario can lead to THAT awkward outcome where you have a lot of fizz and not so much food to eat…not ideal if you want to get out of bed the next day! My solution = make your own. If you are heading to see family or friends, how about taking along some food contributions that you know are safe. 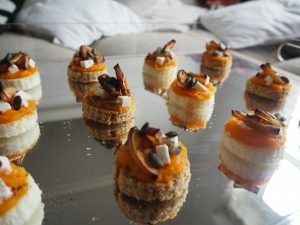 Equally, if you are hosting, you can make your gluten free guests feel at home with some tasty gluten free canape options. My gluten free canapes are so good that you can just feed these to everyone and they won’t clock they are gluten free, trust me. I partnered with Juvela to develop some simple and tasty gluten free canapes: 1) butternut squash, roasted apple, feta and pumpkin seeds, 2) a Mediterranean avocado, pesto, tomato and pine nut with fresh basil, and 3) chilli garlic prawns. I rate Juvela’s gluten free bread really highly as it has brilliant texture and holds together well, working brilliantly for these gluten free canapes. Some other gluten free bread brands I tried in previous years would just crumble into a horrible dry mess. 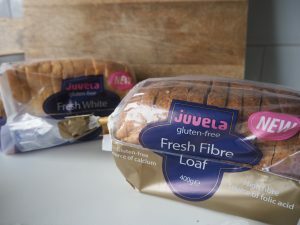 Juvela’s gluten bread comes in both white and fibre varieties and is currently available in Tesco stores nationwide. 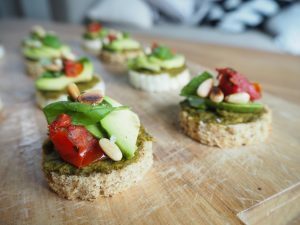 These gluten free canapes are quick to make and I have detailed below how to make then dairy free and vegan too where possible, in case you are catering for multiple allergies. It is Christmas after all, so let’s keep those party crowds happy! 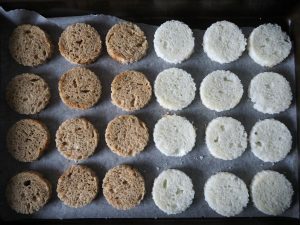 The three canape recipes below all use a Juvela gluten free bread base to keep preparation as easy as possible. I used a mix of Juvela gluten free white and fibre breads to give some variation and have suggested my recommended bread for each recipe. Any other gluten free bread variety could also be used for these if you cannot get Juvela, but try to use one that has good structure and doesn’t crumble easily. 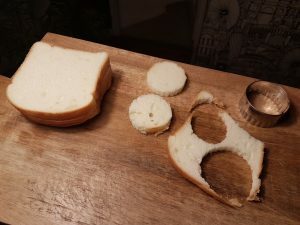 Using a small cookie cutter (I used a 5cm cutter, which was ideal) cut two bread disks out of a slice of Juvela bread. Save the offcuts as you can use then to make breadcrumbs for other recipes (such as this salted caramel treacle tart). 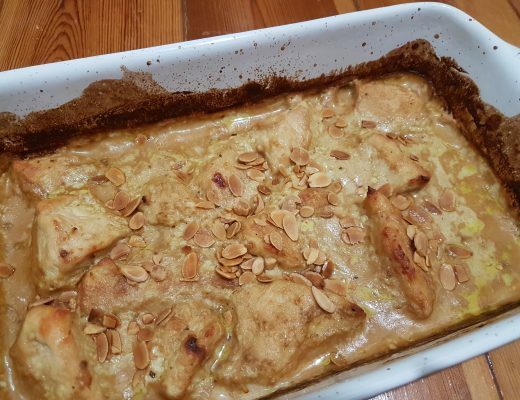 Line a baking tray with some non-stick baking paper or greaseproof paper. Carefully lay the bread circles onto the tray and then pop them into the oven for 10 minutes. 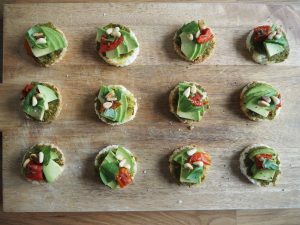 If you are making the Mediterranean avocado canapes, you will spread pesto on the disks after 5 minutes of cooking then cook for a further 5 minutes (to make the total 10 minute cooking time). Remove the disks from the oven and set aside to cool on a wire rack while you prepare the toppings. 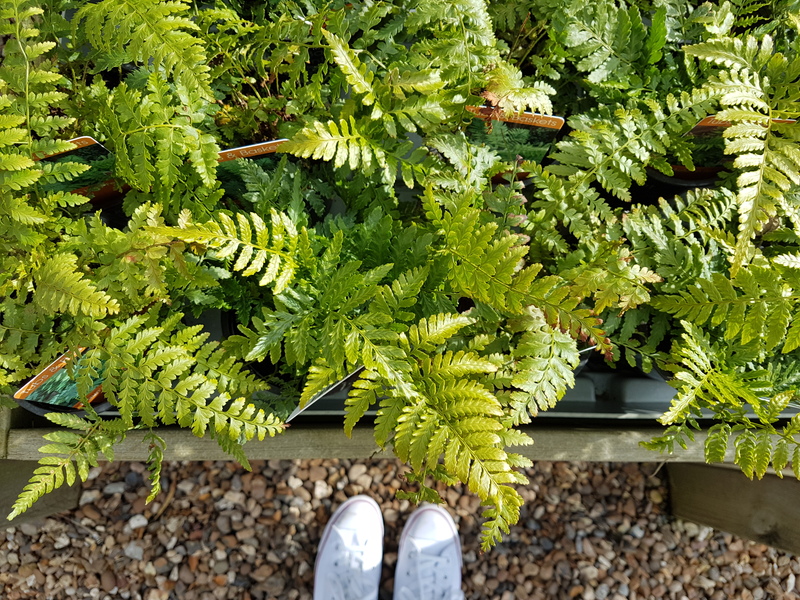 These fresh, zingy canapes will brighten up your canapes spread with bright green and red hues. It’s also lovely to have some variation from the usual unhealthy, deep-fried canape offerings. They are inspired by the Mediterranean, as creamy avocado meets intense tomato and pesto flavours and the crunch of pine nuts. I think these work best on Juvela gluten free fibre bread. A small jar of pesto (approx 190g, although you won’t need it all) or fresh pesto if you are feeling fancy! 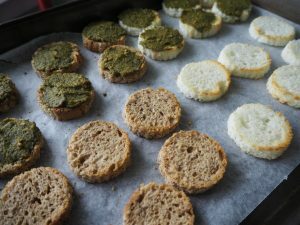 Prepare the bread disks as detailed above – halfway through cooking (after 5 minutes) spoon half a teaspoon of pesto onto each bread disk and spread it evenly to the edges. Then bake for a further 5 minutes before setting aside to cool on a wire rack. Slice the avocado in half, peel off the skin and remove the stone. As pictured, cut the avocado into thin slices and then slice lengthways. You want to end up with enough slices to allow 2-3 for each canape. Fan the avocado slices out by pressing down on them slighly and then squeeze a generous amount of lemon juice all over them. This will help stop the avocado from browning too quickly. 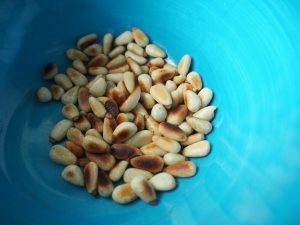 Toast the pine nuts lightly in a pan and set aside to cool. Now you can assemble your canapes! Place the disks on your serving platter, to save you having to transfer them all again after you have finished. On each pesto bread disk, fan out 2-3 pieces of avocado. Top with a piece of sunblush tomato, two or three pinenuts and half a basil lead. Finally, sprinkle each with a little freshly milled black pepper and sea salt and a tiny drizzle of extra virgin olive oil (a quarter of a tsp). Serve straight away! 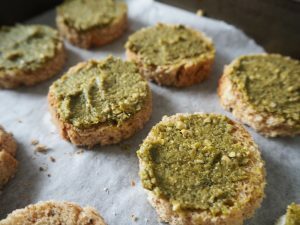 To make these canapes both dairy free and vegan, simply use a dairy free pesto or make your own and use a vegan hard cheese in place of parmesan. They would still be just as delicious! 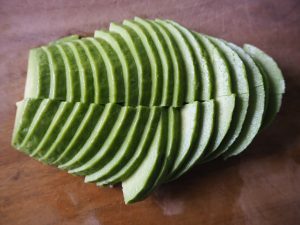 They are best served immediately, as the avocado will brown gradually, but you could make the various elements in advance and then assemble just before serving if you want to save on prep time. 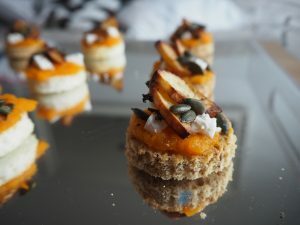 The sweetness of squash and apple meet salty feta and crisp toasted pumpkin seeds in this gluten free canape recipe, and the bright orange of the squash makes them visually stunning. I like these on both the Juvela fibre and white breads, so maybe go for a mix of the two for the best presentation. Halve the butternut squash and scoop out and discard the seeds and pith. Place the two halves on a baking tray and score the flesh (this will help it cook more quickly), then drizzle with a little oil and some salt and pepper. Now place in the oven and slow-roast for 1-1.5 hours or until the flesh is really soft. 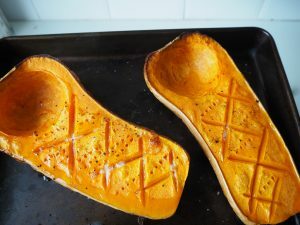 The slow roasting will bring out the natural sweetness in the squash to make your canapes extra tasty. Wash and core the apples, then chop into slices and then in half again (leave the skin on for colour). 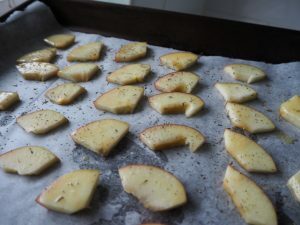 Place the apple pieces on a baking paper-lined tray, brush each piece with butter and sprinkle with dried thyme. They then go into the oven at 160C with the sqush for the final 20 minutes of cooking time, until soft and lightly coloured. When cooked, remove and set aside to cool. Scoop the butternut flesh off the skin and pop the chunks of soft butternut into a blender (discard the skin). Blitz until smooth with the honey and nutmeg. Then season to taste with salt and pepper. This butternut puree becomes the topping for your bread disks. Spoon a teaspoon of the puree onto each bread disk and gently spread the pile to the edges of the bread. 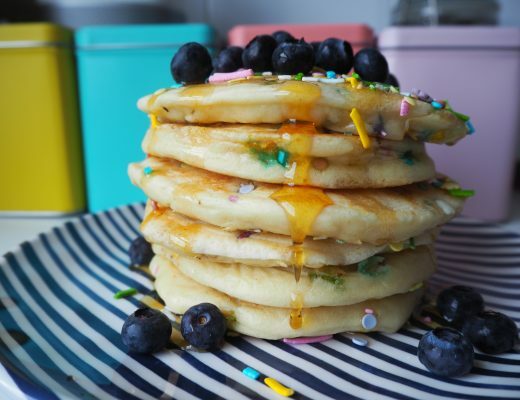 Place the topped disks onto your serving tray or platter, before you add the other toppings. Chop the feta into small chunks so you have 72 little cubes. 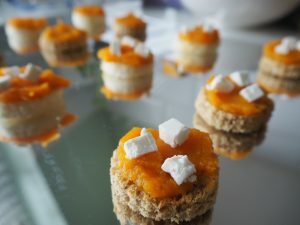 Each canapes gets three feta pieces, so you can now place these straight onto the butternut puree. Toast the pumpkin seeds in a saucepan until they start to crackle, then set aside to cool. 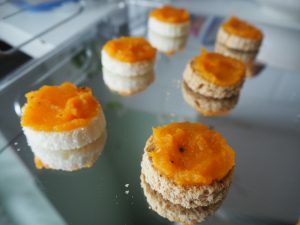 While these are cooling, place two apple chunks onto each canape – pressing them lightly into the butternut puree to give some height to the canape. Finally sprinkle each canape with a few pumpkin seeds and freshly milled black pepper. Another simple but stunning canape! 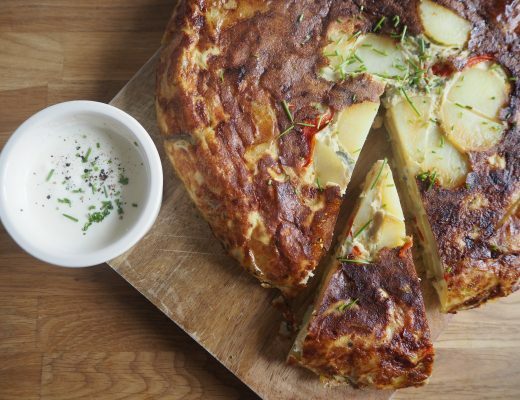 To make this one dairy free and vegan, use oil to brush the apples instead of butter and switch the feta for a vegan cheese alternative. A sizzling hot canape inspired by Spanish tapas flavours. 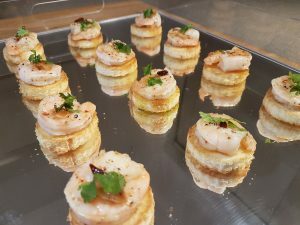 We love the chilli garlic prawns you often find as a tapas dish, hence I wanted to transfer those mouth-watering flavours into canape form. 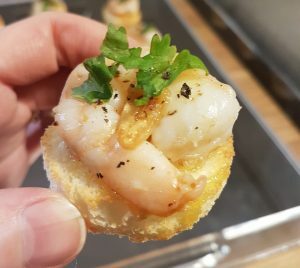 I like to think I have achieve that nicely with these delicious chilli garlic prawn canapes. 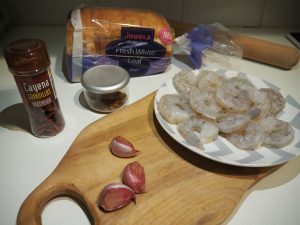 Each prawn nestles on a disk of Juvela gluten free white bread, which soaks up all those lovely chilli garlic flavours. This recipe is also naturally dairy free. Place your toasted Juvela white bread disks on your serving platter or tray, ready for the prawns as soon as they are cooked. These canapes are best eaten hot so you don’t want to be messing around arranging them after cooking. 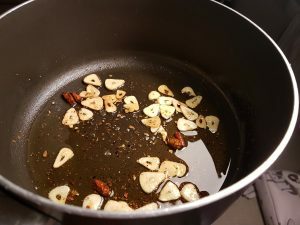 Place a non-stick saucepan over a low heat and gently cook the garlic and chilli in the olive oil. Slow-cooking is the key here, to help infuse those beautiful flavours and to soften the garlic slices without burning them. I let the flavours fuse for about 10 minutes. Now add the prawns to the pan and turn up to medium-low. Stir with a spoon until the prawns have turned pink and are cooked fully. Sprinkle with salt and pepper. Carefully place a prawn onto each bread disk, then add 1/2 a teaspoon of the chilli garlic juice to each disk along with a couple of slices of soft garlic and chilli – these will soak into the bread to give the canapes a beautiful flavour. Finally top with a piece of fresh coriander or parsley and serve straight away. There you have it! My gluten free canape selection for your Christmas parties. Be sure to tag me (@myglutenfreeguide) on Instagram if you have a go at making them this festive season, I would love to see your Christmas feasts. *This was a paid sponsored feature in association with Juvela in 2017. I only ever advertise gluten free products that I personally enjoy and am happy to recommend to you all. All opinions on www.mygfguide.com are my own and are 100% genuine.